You do great work. I love the work you do. I love your use of comic books to improve literacy among kids and incarcerated folks. But app design is not your strength. There are so many things we could talk about. We could talk about getting a login for the site, and then have no way to enter that login on the app once you download it to your phone. So I end up not having a login for the app because I didn’t want to create a second one. We could talk about how there doesn’t seem to be any relationship between guest categories, panel categories, and icons. We could talk about whether or not an apocalyptic event would occur if you were to link a guest name to their Wikipedia page. We could even talk things that are a little better than last year - I think the street level map is improved. 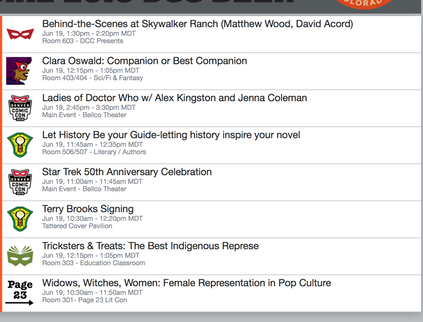 But let’s focus on one concept, one tiny but fundamental concept: the creation of a favorites list for planning your day at Comicon. Because there are a dozen panels going on at offset times, and it’s hard to get through a day and not miss some really good stuff without a little planning. And there is good stuff at Denver Comicon. Step One (which I’m doing on the website due to login problems, see above) Find the day’s events. On the top navigation, it’s two clicks to the schedule, one click to tomorrow. Not bad. But once I’m in “The Show," that navigation is replaced with Pop Classroom navigation, and the only way back to this navigation is to re-enter the URL. Hopefully there’s nothing useful anywhere else there. Because I’m focused on making the most of the day, I’m not seeing anything but the calendar. It’s the primary activity, I would bet, for most show-goers, once the event starts. And I’m guessing the little stars mean things I can favorite! Good news, because this list is totally long. So now I painfully work my way through the list. There is no way to get more information on a session within this page, I have to go to another page, and then back. if I want to know who someone is, because I don’t recognize them, I have to click again. There’s no breadcrumb, so I have to navigate back manually. After about 45 minutes of this, counting the second browser tab where I’m checking people who don’t have biographies with their Wikipedia entries, I have a list of favorites. Wahoo! So where are my favorites? They’re mine, my personal subset, so I figure they’re under my profile. Nope, not there. But there is an “Export Favorites” option, maybe it will open them up so I can see them. Nope, it just downloads a file that it doesn’t show me, tell me the name of, or give me any control over. Goodie. So where could they be on the site? Yup, this central activity, this common task, this list I just finished personalizing, in exchange for which I gave you personal information, is under “More.” Naturally. But it is there! Wahoo again! I am close to having a personalized list of activities so that I can plan my day . . . right? Right? NOT REALLY. Because you, using logic that is pretty exclusive to your own self, have given me my list in alphabetical order. Who on earth, who on any planet, (since we’re being all Con-ish) wants to see a schedule in alphabetical order? Is this the way you are organizing your lives, you poor dear things? Because if so, please consider changing to chronological order. It could be that you are missing out on some great things in your life because you have no idea what is happening when. Get better soon, we need you. P.S. The “Export Favorites” function gives me this non-functional list. Well, it is functional, but only if the WiFi at the Convention Center is working. Which it wasn’t yesterday . . . Seriously, get better soon. We need you.